iFoam Injection Foam is safe, fast and super-efficient. It just takes 3 steps to surround your living space with foam insulation that stops drafts, ups R-value and cuts the cost of staying comfortable. 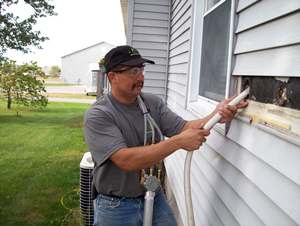 iFoam Injection Foam insulation can be added to walls from inside or outside your house. The popularity of spray foam insulation is easy to understand. In addition to offering high insulation value (over R-6 per in. ), spray foam insulation can also seal air leaks –an energy-saving benefit that “fluffy” insulation (fiberglass and cellulose) can’t provide. Spray foam is super-sticky when it comes out of the application nozzle, and it cures to a stiff, durable mass. It won’t shift out of place or compress like fiberglass batts can. Spray foam expands like crazy as it’s applied –typically to around 8 times its initial volume. This expanding action makes spray foam great at filling spaces completely, eliminating “voids” or empty spaces that diminish insulating effectiveness. The expanding action of spray foam is excellent for sealing and insulating open cavities. But the pressure caused by expanding foam sometimes creates problems. For example, only special low-expanding foam can be used to insulate around window and door frames, to avoid pushing the frames inward. Also, two-part foam shouldn’t be sprayed into an enclosed wall cavity because its expanding force can force drywall to bow outward or pull away from studs. Injection foam, like the iFoam insulation available from Dr. Energy Saver, provides many of the benefits of spray foam, but it doesn’t create expansion problems. Excellent R-value. Like spray foam insulation, iFoam combines the benefits of air sealing with high R-value. iFoam is rated at R-4.6 per in. at 75degrees. But iFoam’s R-value increases to R-5.1 per in. at 35degrees and lower, providing added insulation value when you need it most. Perfect for retrofit applications. Many 2-part spray foams can’t be sprayed into a finished wood-frame wall because high expansion rates will cause the wallboard to bow or even pop off the wall. iFoam is non-expanding. It’s designed to flow and fill around electrical wires, outlet boxes and existing underperforming insulation. It’s a great way to give an existing house a comfort and energy-efficiency makeover. Q: "Our house is just a few years old, and I know all the exterior walls are insulated with fiberglass batts. Why can I still feel drafts and cold spots when I’m sitting next to an exterior wall?" A: Many homeowners experience this problem. Research done at the Oak Ridge National Laboratory has demonstrated that fiberglass batt insulation loses up to 50% of its R-value as outdoor temperatures drop. Add to this characteristic the fact that batts are often incorrectly or incompletely installed (with voids or empty spaces) because of wiring and electrical boxes in exterior walls. Fiberglass can’t stop air movement, so cold exterior air that enters wall cavities can easily pass into your living space around electrical boxes and baseboard trim. Fortunately, you can put an end to these comfort and energy problems by having iFoam from Dr. Energy Saver injected into your walls. iFoam’s R-value actually increases as the temperature drops. The foam is engineered to flow completely around existing insulation, filling voids to stop air and energy leaks. Dr. Energy Saver will recommend specific insulation and air-sealing upgrades and provide a Free Estimate to perform the work. Our installation technicians aren’t subcontractors; they’re trained and certified at our corporate headquarters in Seymour, CT. You can be sure that you’ve got the right insulation installed in the right way.